Regal Rabbit pledges to operate in an ethical and environmentally aware manner, which includes recycling and the use of natural and ethically sourced ingredients. And of course, we only test our products on our human friends - and never on animals. I fell in love with soapmaking in 2001. It was my dream craft - a self-cleaning hobby! I started out making melt and pour ("glycerin") bars but as my skin became more ahem...mature, I developed an interest in formulating gentle, pampering, recipes to nurture and nourish my skin. When my soap shelves got too full, I began giving away bars to family and friends. With their encouragement, my soap company was born in 2003. In order to keep up my passion for the business, I have always donated 100% of profits to worthy causes, such as the American Cancer Society or local parks and greenway projects. In 2012, I decided to focus on animal charities, such as rescues and animal education and rehabilitation organizations. 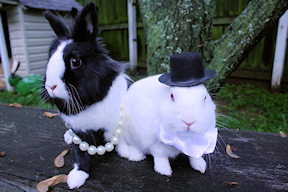 Meet Dottie and Grover, our two regal house rabbits. Every year, thousands of rabbits are abandoned to shelters or released outdoors -- where domestic rabbits can't survive. This is often because they're given as Easter gifts by parents who don't understand that bunnies aren't really good "starter" pets for children. Dottie and Grover were two such rabbits, who were turned over to the local animal control office. They were lucky enough to be saved by a rabbit rescue, and our family was lucky enough to adopt them! Regal Rabbit Soaps is our way of giving back to the animal heroes, such as the rescue that has brought so much happiness to our home. 100% of profits are always happily donated to animal welfare and rescue organizations.